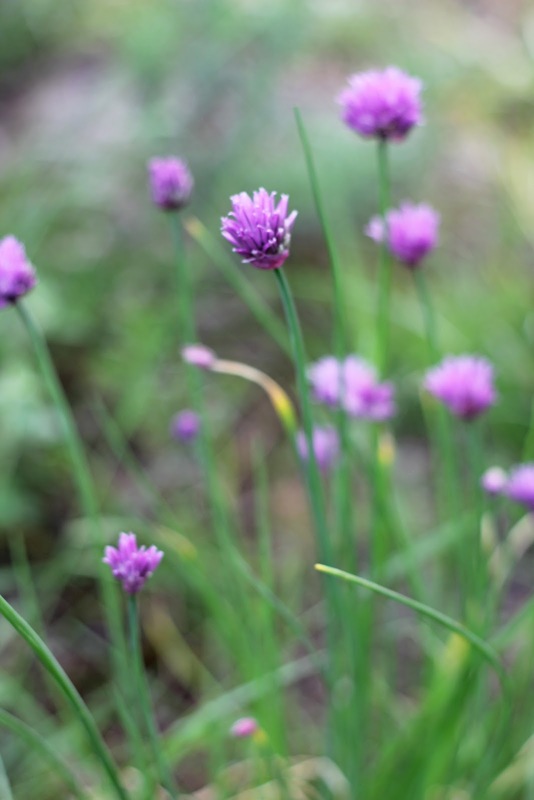 Chives are abundant now, their cheery blossoms blooming in my yard and waving from curbside gardens as I take walks around our neighborhood. The sturdy green stems burst with delicate onion flavor and enhance salads, eggs and any dish they are snipped into. When I saw this month’s #baketogether challenge, I knew chives had to play a role. Abby Dodge shares her delectable recipe for Cornmeal Buttermilk Muffins and invites us to play around and get creative – always fun! 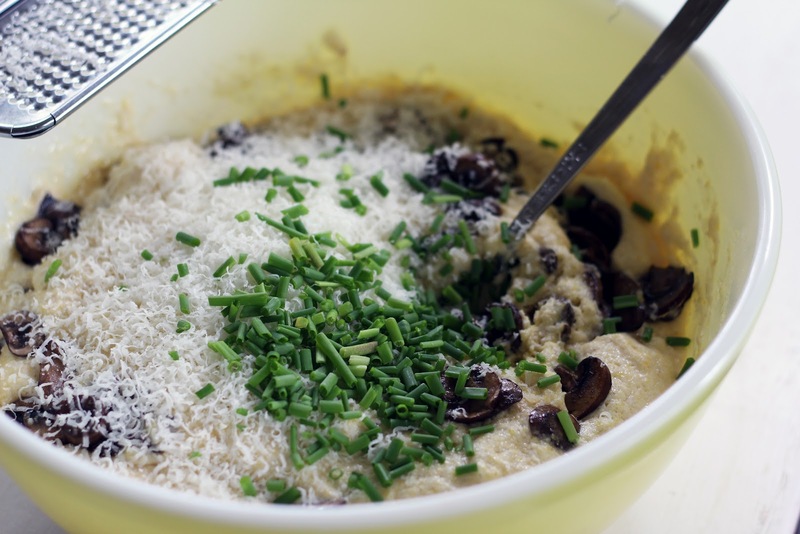 My thoughts were already on a savory track with the chives, so drawing on a favorite omelet combination I sliced baby bella mushrooms and grated Parmesan cheese. Whenever possible these days, I swap out flours to try different ones. This time I included barley flour with the cornmeal and all-purpose flour. I recently found a couple of brioche pans at a local thrift store, so I baked the batter as a loaf rather than muffins. Let me just say, this is like cornbread elevated to new heights! 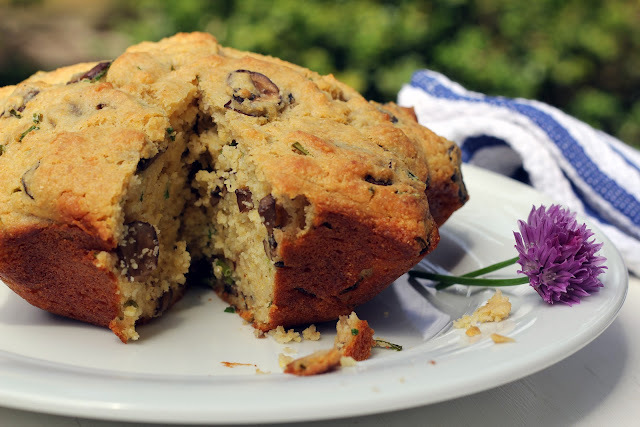 The loaf is extremely moist, studded with mushrooms and flecks of chives, rich with Parmesan and a bit of zip from lemon zest. When sliced, it makes a nice little appetizer to nibble on with a glass of white wine. Perfect for a summer afternoon! Preheat the oven to 350 degrees. Butter a brioche or loaf pan and set aside. In a medium sized pan, warm a drizzle of olive oil over medium heat high and sauté the mushrooms until they release juices and begin to brown, about 10 minutes. Set aside. In a large mixing bowl, whisk together the flours, cornmeal, baking powder and salt. Stir in the chives and Parmesan cheese. In a small bowl, whisk together the buttermilk, eggs and canola oil. Pour over the dry ingredients and add the mushrooms. Using a rubber spatula, gently fold until just blended (don’t worry if there are a few lumps). Do not over mix. Spoon the batter into the prepared pan and bake until golden and a skewer comes out clean, about 45 minutes. Let cool for 10 minutes, then remove from pan and serve in wedges. I love it in the brioche pan, so beautiful and I love your variation on the recipe. Am waiting for my chives to get as big and beautiful as yours are. Love this recipe! Thank you, Suzanne! This was a fun recipe to play with - I think I'll try a sweet variation sometime(it's important to balance the savory with some sweet, right?). Great idea...and some of my favorite flavors too. I love the shape; very nice job. And now I'm peering out the window to see if I have any chives yet! Thank you, Susan! Abby's recipe was a terrific one to get creative with this month. Enjoy some chive love! Mmm, this looks so good! 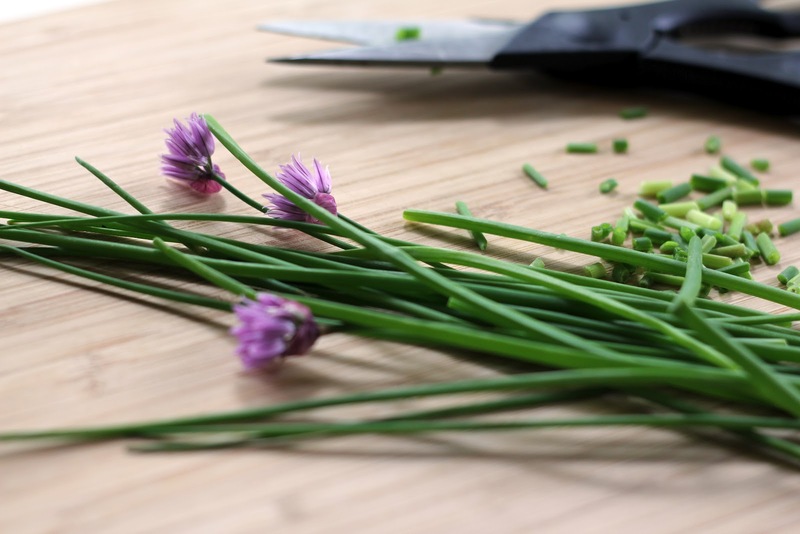 Time to get my scissors and head outside for some chives! Thank you very much! I need to snip some more chives, too...so many ways to gobble them up. This is just what I need for all the chives in our backyard! 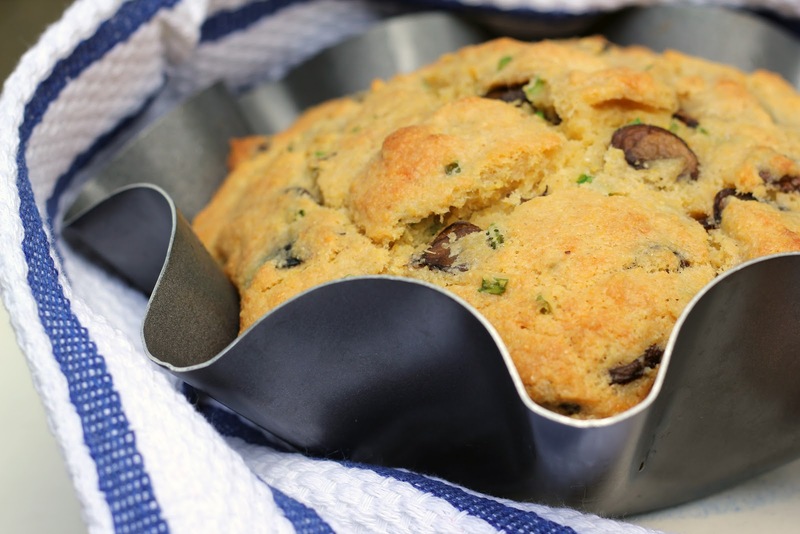 It's so cute in your ruffled pan. I need to get one of those! Thanks, Mikaela! I found it at Value Village - one of those "yes!" moments. I can't believe you found brioche pans at a thrift store! I guess I need to go thrifting more often. What a find! This cornbread sounds so amazing. What a fabulous accompaniment to a simple soup or salad. Thanks, Lauren! The brioche pan find was indeed a thrill. I also found an adorable little walnut grinder that attaches to a Mason jar - I love poking around and discovering old treasures! Thank you, Mairi! Hopefully you come across barley flour sometime. It's become one of my favorites. Kim Boyce's strawberry barley scones (in Good to the Grain) are beyond good.